Since I started this baking journey, I have gotten requests to post about all sorts of things. Savory cupcakes, doughnuts, lemon bars, pickle cupcakes (oh hubby, where do you come up with this stuff?) and most recently, all things chocolately. Since the office pals were tickled silly by my Oreo Balls, I decided a choco treat was just the thing to do. I have dazzled my office peeps with my baked goodies for over a year now, so I wanted to go out with a bang on my last day. Go BIG or go home people. I whipped up a peanut butter cookie sandwich (next post!) and THIS brownie. 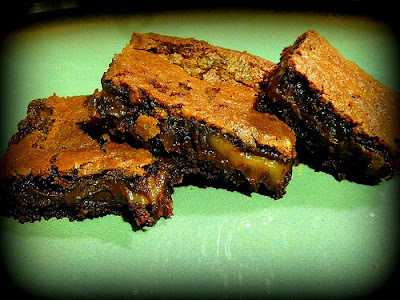 This brownie will change your life. And if you have too many, maybe the way your jeans fit too. It's rich, chocolately delicious, delightfully gooey and oozing with caramel. Sound like something you may want to indulge in? In the words of one of my office buddies, "You'll have your hand on the second one before you even finish the first." Beware! 2. Mix 2/3 cup of the evaporated milk and butter into the brownie batter. Spread half of the batter into an ungreased 13 x 9 baking pan. 3. Bake this portion of batter in oven for 15 minutes. 4. Heat caramels and remaining evaporated milk (1/3 cup) in small saucepan over low heat, stirring it constantly, until caramels are melted. 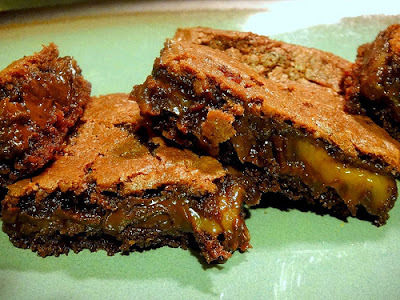 Sprinkle chocolate morsels over the baked brownie mixture, then drizzle melted caramel mixture over it. 5. Drop remaining batter by heaping teaspoons over the caramel mixture. 6. Bake for 25 to 30 minutes or until center is set. 7. Cool in pan on wire rack.